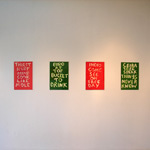 Edgar Heap of Birds intervenes into the space of the city through the authoritative, dominating form of the billboard. 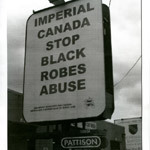 The statement, “imperial canada stop black robes abuse,” disrupts the dominating, commercial space and demands attention as an exhortation relating to historical crimes and omissions committed by the church and judicial systems. Hock E Aye Vi (Edgar Heap of Birds) has exhibited his works at The Museum of Modern Art, Whitney Museum of American Art, National Museum of the American Indian, Smithsonian Institution, New York, New York, The National Gallery of Canada, Ottawa, Museum of Contemporary Art, Sydney, Australia, Documenta, Kassal, Germany, Orchard Gallery, Derry, Northern Ireland, University Art Museum, Berkeley, California, Association for Visual Arts Museum, Cape Town, South Africa, Lewallen Contemporary Art, Santa Fe, New Mexico, Hong Kong Art Center, China and Bandung Institute of Technology, Bandung, Indonesia. He has received grants and awards from The National Endowment for the Arts, Rockefeller Foundation, Louis Comfort Tiffany Foundation, Lila Wallace Foundation, Bonfil Stanton Foundation and The Pew Charitable Trust. In June 2005, Heap of Birds completed the fifty-foot signature, outdoor sculpture titled Wheel. The circular porcelain enamel on steel work was commissioned by The Denver Art Museum and is inspired by the traditional Medicine Wheel of the Big Horn Mountains of Wyoming. Heap of Birds’ art work was chosen by the Smithsonian’s National Museum of the American Indian as their entry towards the competition for the United States Pavilion at the 52nd Venice Biennale. He will represent NMAI with a major collateral public art project in Venice, June 2007.